Access Australian case law, dating back to 1986, alongside Commonwealth case law. This collection includes cases from the High Court of Australia, and appellate courts from the Australian Capital Territory, New South Wales, Northern Territory, Tasmania and Victoria. 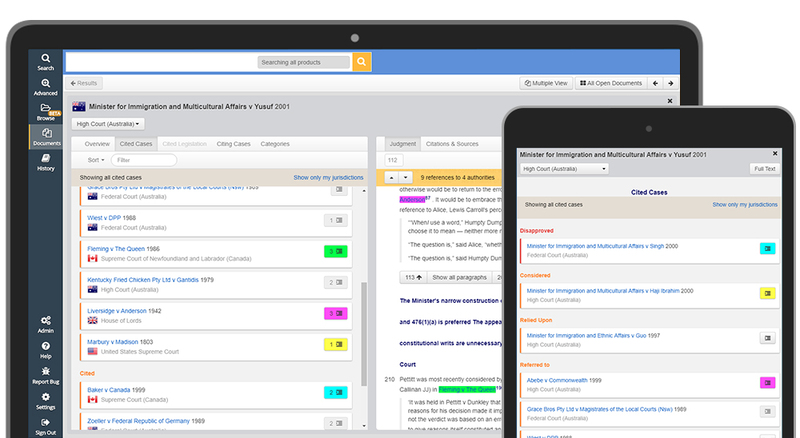 Justis also provides the largest collection of UK superior court judgments, the largest collection of Caribbean cases, the largest collection of Irish case law, extensive Canadian, New Zealand and international cases, all on our flagship legal research platform, JustisOne. 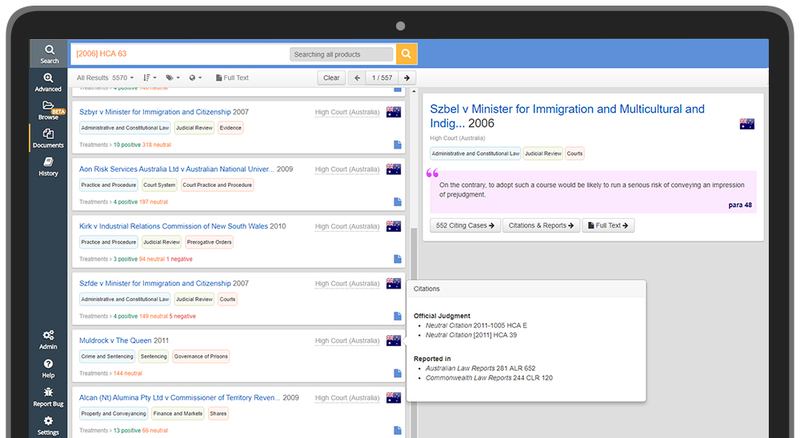 Find over 100,000 Australian cases on JustisOne, including 59,000 full-text cases. JustisOne is also updated daily, with over 250 Australian cases added each month. While many online case law providers restrict your search results to their content, JustisOne allows you to find commonwealth case law and Australian case law across 120 other online services. Including AustLII, Jade and TimeBase. 12 of the top 15 Australian universities for law, as listed in the Times Higher Education World University Rankings 2018, subscribe to Justis. Important cases are often reported in different series and publications. 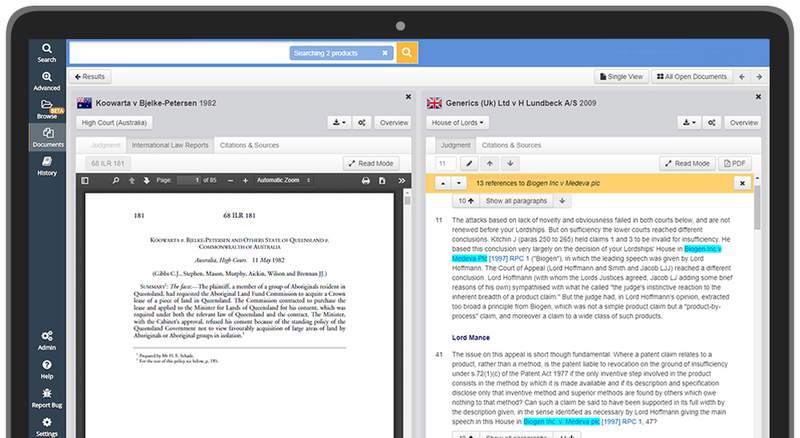 JustisOne links together the different citations and versions of a case, making it easier for you to find what you’re looking for, and without unnecessary duplication. Search for transcripts of cases published in: Australian Law Reports, Commonwealth Law Reports, Federal Court Reports, Australian Law Journal Reports and many more on JustisOne. 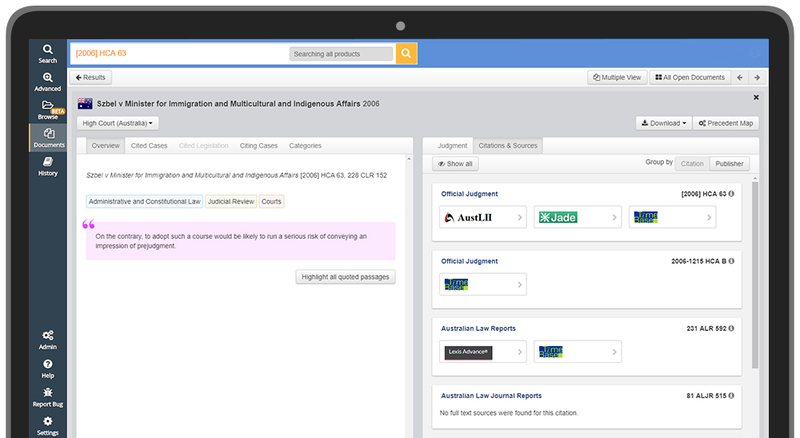 There are over 47,000 citation relationships between Australian cases and cases from the UK that can be viewed on JustisOne. Simply use the citations in context feature to highlight these cross jurisdictional relationships. View the most cited paragraph of a case, visually identify good law, and find more related cases. 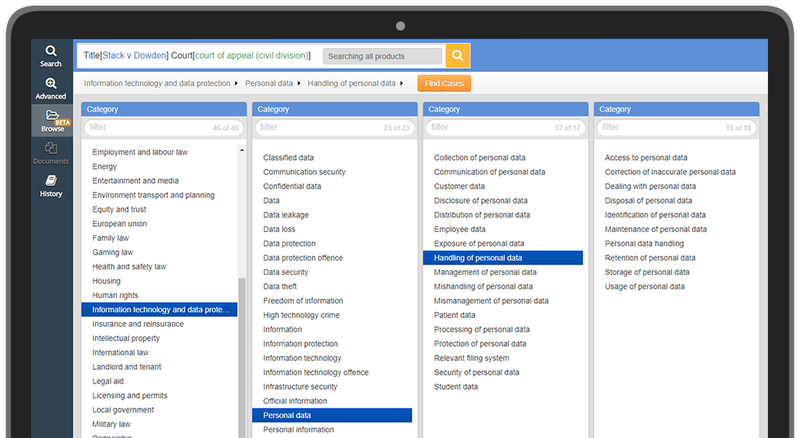 Plus, refine your Australian case law searches with the world’s largest legal taxonomy, which powers JustisOne’s category browser and offers more detailed searches than any other case law service. All data displayed has been collected between 2017-2018. Linking to external services may require additional subscriptions with third parties which are not included in Justis subscriptions. All subscriptions are for a minimum of 12 months. Accessing JustisOne will require devices to be connected to an organisation’s network if IP recognition is activated. All logos and names of publishers, commercial providers and services are provided to us by the respective organisations operating these services, and are shown here for an accurate representation of the services. The price advertised is for one Core product and one user subscription only. Prices are subject to change, are based on current exchange rates, and exclude all applicable taxes and VAT.